The WiiWare has unfortunately seen little attention over the last few years, receiving very few games and even fewer quality ones. There have been a few rare exceptions however, with innovative and creative titles such as World of Goo and Hydroventure/Fluidity appearing on the WiiWare service. 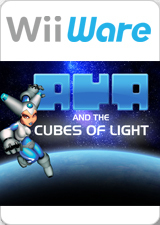 While Aya and the Cubes of Light does not breakthrough to this point of greatness, it does stand out amongst the legions of underwhelming games that infest the WiiWare service. That being said it isn’t all that great, but if your looking for a platforming title for WiiWare that’s not from the Virtual Console this may be just the game for you! 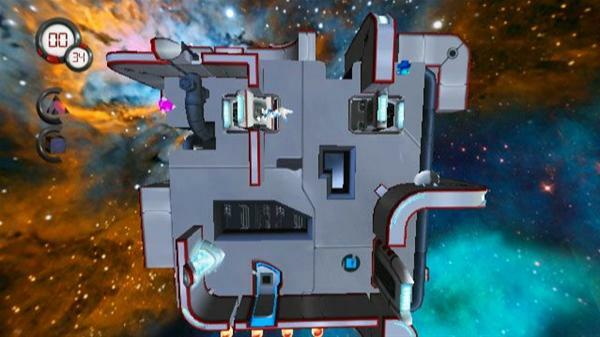 Aya and the Cubes of Light is a gravity-based platformer filled with various puzzle elements. Think Mario Galaxy, except less polished, less charming, less colourful, on a 2.5D scale and with a major focus on pointless motion controls. So it’s like Mario Galaxy, but totally different. Players take control of Aya as she explores random floating cubes in space…for something to do with restoring power to the stars or whatever. 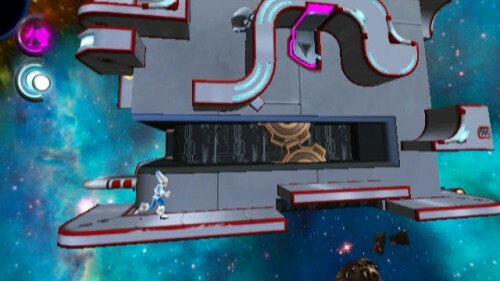 The point is your in space and gravity is crazy, which makes for some interesting and creative level design and puzzles. Aya can walk up walls and such, and as you walk around a cube you will find yourself on different sides of it where gravity will point in different directions. With a new perspective on a familiar area Aya will often need to take daring leaps of faith to land on platforms or to collect items which appeared unreachable before, and this is where Object Vision Software has excelled as they have pulled this off nicely. Sure the difficulty can be pretty annoying, but it makes figuring out particular puzzles more enjoyable and makes for a rewarding experience if the player has the patience to pull through. While the concept and level design is great however, what truly stops Aya and the Cubes of Light from reaching greatness on the most part is it’s controls. For some bizarre reason, it seems that the developers have gone with the “it’s on the Wii, so we must overuse motion controls and piss the player off” approach. Almost every aspect of the game requires motion control, and 90% of the time it’s just unnecessary. 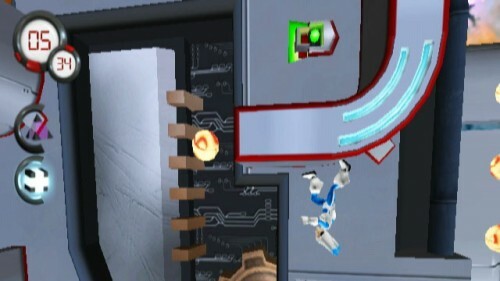 To jump, the player must flick the Wiimote. Problem? 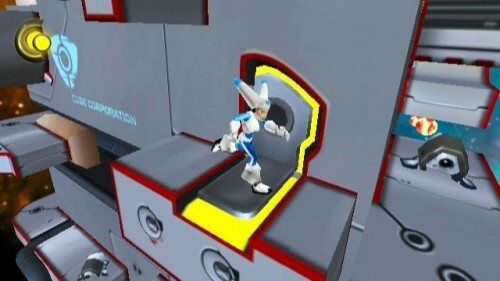 It’s a platforming game, players will need to jump a lot and doing so much can be tiresome on your wrist. Whenever this isn’t annoying you, awkward pulling motions to activate panels will. This would be fair enough if players were given the option to just simply have a button-mapping option, or a preset to choose alternatively, but it simply isn’t the case here. So while level design is for the most part rather admirable, traveling around these levels can be very frustrating and really holds back the entire game from reaching it’s true potential. Aya isn’t the prettiest title on the Wii, but for a WiiWare game utilising 3D character models it’s good but don’t expect to be wow-ed by anything. Textures, animations and character models are of the same standard as the music and sound effects: good enough. Nothing’s bad but little will sound or look all that impressive. The only thing that may remain memorable is the lack of colour, as the majority of all graphics are based around various shades of grey and blue, resulting in a very dull looking game. One may argue that’s the goal of the visual aspect of the game and call it ‘artistic’, but in my honest opinion it just looks bland and dull. The nicest graphic in the entire game is the space backdrop as it is the most colourful and charismatic, but it looks a little too much like a stretched out photograph and with the dull-coloured, almost lifeless 3D models in the foreground, it just simply looks out of place for the most part. Sadly due to a lack of polish, Aya and the Cubes of Light looks just decent at best, and the looping soundtrack is so easily forgettable Im literally struggling to think of anything to say about it whilst writing this review. Aya and the Cubes of Light shows promise and potential but sadly never reaches it. This game could’ve easily been much more as it sports a creative concept and splendid level design, but is severely held back by it’s awkward control scheme. What doesn’t help is that due to it’s bland presentation of both visual and audio as well as a general lack of polish, there leaves very little redeeming qualities for Aya. That being said the heart of the game is still there in plain sight. This isn’t just another crappy WiiWare title, Aya and the Cubes of Light can be solid fun when you give it the chance, even if it is short lived. Still, it’s of a much higher standard compared to most of the other twelve (Yes I said Twelve!) WiiWare games us Aussies have received for download this year.